Earlier in 2014 the Challenge website suggested that the remarkable series of all Buxtehude’s extant works — alas, many more were written which have not survived — from Ton Koopman and the Amsterdam Baroque Choir and Orchestra was complete. The documentation on CC72256 referred to three more releases. Earlier in the series as many as two dozen CD sets were projected by the label’s PR staff. This apparent confusion notwithstanding, here is Volume XIX - the ninth to present the composer’s vocal works. In his notes in the booklet that comes with the CD Koopman refers very obliquely to ‘new’ cantatas and ‘something unexpected’; but that seems to relate to the quality of the music - not anything actually newly discovered. So for the time being let’s assume that this nineteenth volume is indeed the last. The quality of Buxtehude’s music here is every bit as high as any other we’ve enjoyed on this monumental cycle from Challenge. Similarly, the care and precision with which each bar, phrase, movement is approached expose the music extremely well. Intonation, phrasing, vocal enunciation all reveal what might otherwise seem obscure and overlooked music; this for all Buxtehude’s reputation as such an attraction to Bach and founder of the North German school. Franz Tunder, Buxtehude’s predecessor at St Mary’s Lübeck, had begun the series of Abendmusiken - concerts in the evenings of the five Sundays after St. Martin’s Day (November 11). They were short, taking place from 4 to 5 o’clock; and independent of the liturgical requirements of the more formal church service. The works on this CD - and indeed many others from earlier in the cycle - illustrate the way in which Buxtehude chose to continue what Tunder began. They’re in no way ‘occasional’ compositions, though. Indeed, there’s a profundity and lasting quality in works like the Pange lingua [tr.5]. This Thomist text would have been excluded from the Lutheran liturgy. Indeed, much of the music here was probably written to ‘divert’: a guidebook from 1697 describes the Abendmusiken as rühmlich (honourable or creditable) - perhaps to emphasise the concerts’ worth despite their not forming part of the preceding service. They are not trivial. Accordingly, Koopman approaches them as substantial and telling. The singing and playing are equally insightful, with due attention to the texts as vehicles for unambiguous confessional thought … meditation and reflection on religious themes. The ten pieces on this CD also have the merit of being presented in a sequence that respects the variety of subject matter - appropriately for their place in the church year. That is, towards its end — and thus only slightly further away from its consequent new beginning. On listeners’ minds would be the imminence of the Kingdom of God, and Christmas; and at the same time the end of the world. Mixed with this is music that underlines the personal, emotional relationship between self and deity. It’s easy to discern the logical extension of the abandonment of the more impersonal seen in by the Reformation as exemplified by the Pietist movement. Although neither Buxtehude’s writing nor Koopman’s conception of performance could be described as romantic, there is much feeling, warmth and immediacy of expression and response in works like Fürchtet euch nicht [tr.7]. Edification there is but with a human, approachable and personal mien. 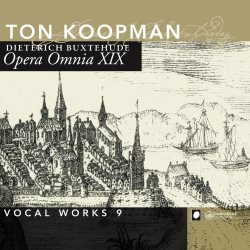 It is perhaps at this juncture more than any other that one becomes aware of just how much more relaxed and able to project the essence of Buxtehude’s music Koopman and his forces have become since the onset of this excellent cycle eight years ago. The music has always communicated positive energy - if not exactly the (admittedly always controlled) gusto of J.S. Bach. It inspires and entices the listener but in these later releases, one feels that Koopman has allowed what he has learnt from such an exploration in depth of music to inform the life which performers breathe into it three hundred years after it was written. It’s music which is both specific to a time and place, and yet which has universal appeal and relevance. The result is greater latitude in expressiveness in the music-making. The singers have made the text and melodic gestures of a work like Ich habe Lust [tr.8] (“I wish to depart and be with Christ”) all their own. In fact, it can really be performed no other way. Again, neither idiosyncratically rhetorical nor falsely idealistic but full of feeling and reflection. The acoustic is that of the Waalse Kerk in Amsterdam, the venue used for most of these recordings. It offers a controlled spaciousness which concentrates the ear on the intricacies and delicacies without stifling the moments of - always bearable - intensity, such as the last third of the Salve, Jesu [tr.2]. The booklet contains commentary by Christoph Wolff, and the full texts in Latin/German with English translation. Whether or not Koopman and Challenge have more delights, you’ll not want to hesitate if you’ve been assembling this series over the last eight years. If this gentle yet persuasive music of the German Baroque - which always has something new to say, and new ways to say it - intrigues, then this CD is one not to overlook.